Take a tour of the new 2019 Tucson and explore the features. Ready for your adventures, the Tucson is filled with the features you’re looking for, like available HTRAC™ All-Wheel Drive and our available BlueLink® connected car system with remote start and climate control for ultimate convenience – especially on cold winter mornings. Can Hyundai’s three-row crossover stand out in a crowded segment? Hyundai offered a long-wheelbase Santa Fe for years, but as we found in our 2017 First Test, the three-row model was more of a two-row crossover with a pair of rear jump seats, not a minivan substitute. To comfortably fit six adult-sized passengers, it didn’t simply need to be longer. It needed to be wider, as well. To fix that problem, Hyundai developed an entirely new model: the 2020 Palisade. Thanks to its larger size, the Hyundai Palisade serves as a more direct competitor for other three-row crossovers such as the Honda Pilot, Subaru Ascent, and VolkswagenAtlas. Of those three, only the Atlas has a longer wheelbase. And although the Palisade is only wider than the Subaru, it’s not much narrower than the other two. It’s also 3 inches longer overall than the Santa Fe XL it replaces. 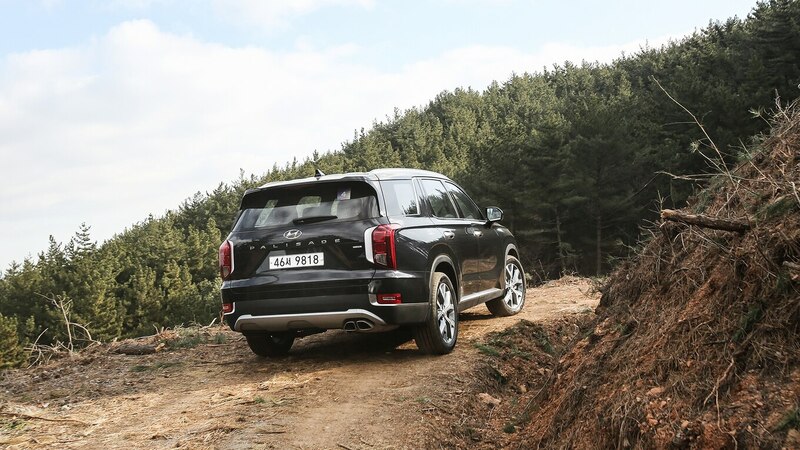 Most important, whether you opt for the seven- or eight-passenger Palisade, the third row now has enough room to comfortably fit an average-sized adult. Even two of them. The Palisade’s second-row seats can also slide forward, adding even more flexibility. But even though Hyundai hopes families will appreciate the Palisade’s size and practicality, it also took a big risk with the styling. We’re still not quite sure how we feel about the look, but with a huge chrome grille, stacked headlights, vertical daytime running lights, the Palisade certainly stands out. Around back, the shape of the taillights complements what you see up front. In profile, however, the shape is much more conventional. Inside, the designers took fewer risks, instead focusing on giving the cabin a spacious, premium feel. We like the clean design, even if the number of buttons in the center console can be confusing at first glance. Plus, by switching to a push-button transmission, they were able to add a truly impressive amount of storage up front. Material choices won’t put Range Rover on notice, but for a mainstream crossover, the loaded version we drove felt pretty nice. Even if you don’t spring for all the options such as premium leather, head-up display, surround-view camera system, and Mercedes-esque 10.3-inch touchscreen infotainment screen, the Palisade will still come well equipped. An 8.0-inch display with Apple CarPlay and Android Auto support comes standard, as does remote keyless entry, adaptive cruise control with steering assist, and automatic emergency braking. Unfortunately, because we drove Korean-spec Palisades, we can’t say much about the powertrain. 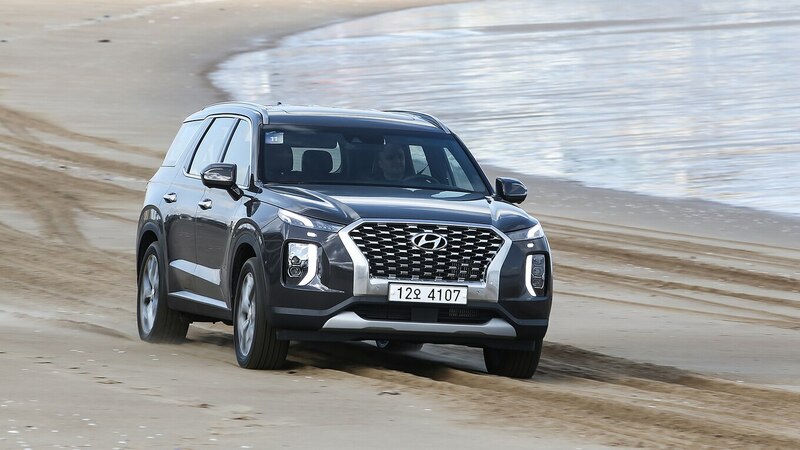 Instead of the torquey 2.2-liter turbodiesel that the cars we drove had, North American models will get Hyundai’s 3.8-liter V-6 making an estimated 291 hp and 262 lb-ft of torque. An eight-speed automatic transmission is offered on both front-wheel and all-wheel drive configurations. Although we can’t comment on acceleration or fuel economy, Hyundai promised everything else would be exactly the same when the Palisade goes on sale in North America. Assuming that’s true, the suspension will be a bit on the firm side but well damped. Add an impressively insulated cabin and comfortable seats, and you get a quiet, refined ride that encourages long road trips. In an attempt to further encourage family adventures, the Hyundai has six drive modes. Most people will probably stick to Comfort or Sport, but there’s also an Eco setting to maximize fuel economy. The Sand, Mud, and Snow modes, on the other hand, offer a little extra help on less-than-ideal surfaces. Even though it snowed heavily the first day of our drive, we never felt like traction was limited enough to require switching out of Comfort or Sport. In theory, we would have had a chance to test out Sand mode, but the organizers seriously underestimated how soft the beach would be when we showed up. After only a few minutes of low-traction shenanigans, our drive partner got the Palisade stuck. Then the driver following behind us got stuck. Then another one. Hopping out to assess exactly how bad the situation was, our feet immediately sank several inches into the sand. No wonder the Palisade had gotten stuck. More speed and lower tire pressure would have probably helped, but even that might not have been enough. Thankfully, one of the few drivers who didn’t get stuck gave us a ride, saving us from a cold, damp, sandy hike back. Considering how soft the beach was, we can’t really fault the Palisade. It’s a solid crossover that just got in a little over its head (or, rather, up to its axles). But the situation did serve as a good reminder that even soft-roading can quickly get out of hand if you aren’t careful. Also, it never hurts to carry a set of Maxtrax and a tow strap. Somehow, though, we think mainstream buyers will forgive the Hyundai Palisade for not being immune to the laws of physics. Consumers are probably more concerned with how spacious and practical it is, as well as what kind of features they get for their money. 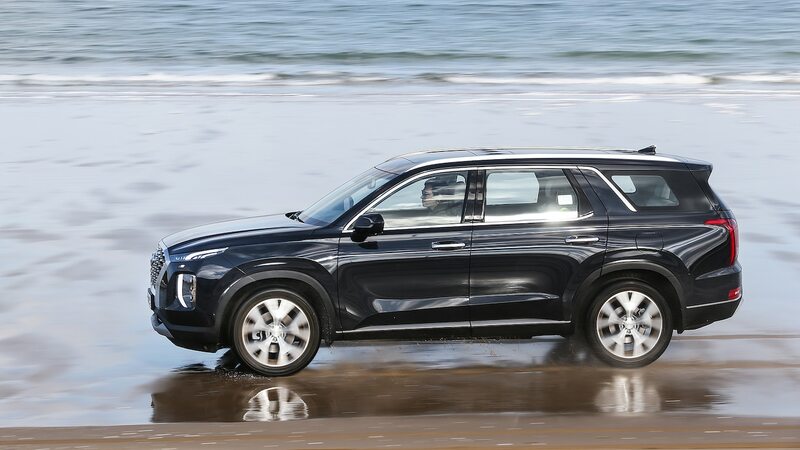 We’ll need to find out about pricing and actually drive the North American version before we can say for sure, but based on our initial impressions, the 2020 Hyundai Palisade delivers a well-rounded package that families will love. For 2019, the Santa Fe is all new, marking the beginning of the mid-size crossover’s fourth generation. The styling is a big departure from the 2018 model, there’s a new 8-speed transmission plus it’s longer, wider and has a longer wheelbase than the outgoing model. Mid-size it may be, but up front, the Santa Fe (base MSRP: $28,999) feels a lot larger than that. The 65mm longer wheelbase has made for more legroom up front and in back, as well as more room to store your wares in the cargo area – you get a total of 1,016 litres behind the rear seats, and 2,019 L if you fold the 2nd row flat. It’s helped by the segmented underfloor storage, each segment large enough to store a 4-litre jug of milk (but more likely used to store wet items). A quick note: while this ’19 Santa Fe replaces last year’s Santa Fe Sport model – it’s just “Santa Fe” now — the three-row Santa Fe XL returns unchanged for 2019. Look for an all-new three-row Hyundai in the none-too-distant future. Up front, the driver’s position will be a boon for shorter drivers, as it is quite high no matter how much you drop that seat. The headliner was a little close for me and my 6’3” frame, but my guess is I’m in the minority when it comes to most drivers. I also can’t help but question the logic of titling the steering wheel away from the driver as much as Hyundai has, but my drive partner – who was smaller than me – said she felt it was just right, so there you have it. The longer wheelbase also provides a more elegant look to the car from the outside, an effect augmented by some nice creases on the doors and around the fenders, as well as a sharp beltline crease that makes the last car look somewhat slab-sided. The wheels, meanwhile, feature all-new designs that now go all the way up to 19 inches. Up front, the addition of a new honeycomb grille and LED DRLs (plus optional LED headlights – they’re halogen otherwise) is shared with the recently-released Kona. On the smaller Kona, it looks sporty, but here it looks a mite more imposing. The DRLs are also a bit of an optical illusion; like the previous Jeep Cherokee, the lights mounted atop the grille are the DRLs, with the headlights appearing below those. While they are borrowed from said Jeep, they look a little less alien here, whether because it’s not as avant-garde now as it was on the Jeep back then, or because they’re a little more restrained. The rear fascia also gets its share of panel creases and detailing to class it up a little, but the real highlight are the 3D taillights; they’re low-profile, and do a good job of looking somewhat BMW X3-esque, which is no bad thing. They are the focal point of the whole tailgate area, making for a very modern look overall. Too bad that like the headlights, the LED taillights only come on the top trim. Inside, it’s an elegant place overall, but one that gets a few nice highlights here and there to spice things up a little. The materials used are all top-quality, and whether in one of the two-tone or more monochromatic colourways, the feeling is one of richness and elegance. As you let your eyes drift across the dash, nice stuff like contrast-colour stitching, aluminum dial bezels and vent surrounds remind that you’re in a properly modern crossover. There is a plastic panel around the door pulls and glovebox that is a little too present, but it’s not a huge knock against the interior as a whole. Plus, if saving money there meant Hyundai could still install the enormous full-length panoramic sunroof on the Luxury model and keep it below 42 grand, then I’m all for it. I assume it also allowed them to cover the headliner and roof pillars in swathes of a fantastic, soft, almost tweed- or houndstooth-like cloth. It’s incredibly upper class, calling to mind a great overcoat or canvas shoulder bag. Leather tends to be the material used to add luxury to a car in this manner, but this is an alternative I’m glad they’ve considered. If you select either of the two bottom trims that don’t come standard with leather, you get an all-new cloth treatment that provides two different cloth types. It would have been nice to see some of the material used for the higher-spec models’ headliners used on the seats, too, but what we do get is a nice departure from the norm. The goal was to ensure that even at base, the Santa Fe was not a “basic” car. At the same time, Hyundai has managed to keep things nice and simple when it comes to the controls. At the outset of our drive, I sat in the car and realized that the seat cooler was on. A quick glance at the centre stack revealed the button required to turn it off; no muss, no fuss. The buttons are all easily reachable, and big enough to be seen with just a glance through the corner of your eye. Feature-wise, the base Essential trim (priced starting at $28,999, it joins three others that reflect Hyundai’s new trim nomenclature: Preferred — $35,099, Luxury — $41,899 and Ultimate — $44,999) comes well-equipped with heated steering wheel, heated front seats, and 7” LCD touchscreen display with Android Auto and Apple Carplay compatibility. Meanwhile, the $1,200 SmartSense safety package adds lane keep assist, forward collision assist with pedestrian detection, adaptive cruise control and automatic high beams. That’s not bad for a base model, though it’s too bad a blind-spot system isn’t part of the deal. You need to step up a trim for that as well as 18” wheels, dual-zone climate control, and power driver’s seat. Luxury trim adds cooled front seats, leather seating and around view parking monitor while the top Ultimate trim adds an 8” display, Infinity 12-speaker audio and heads-up display. It’s the tier 2 “Preferred” trim however, that adds the crown jewel to the Santa Fe’s new safety features: Safe Exit Assist. Essentially, for 10 minutes after you’ve parallel parked, the system watches for traffic around the car. If an overzealous child decides they want to fling open the door into the path of that oncoming bus, the system will not let it happen. The tech goes hand-in-hand with a rear occupant warning that first reminds you to check the back seat, then sends a message to the Hyundai Bluelink app if you happen to leave a pet or child back there. That app also allows for remote start with climate control activation, remotes access, find my car, and more. You get a five-year in-car data plan with your purchase. Base models come equipped with a 2.4L four-cylinder, good for 185 hp and 178 lb-ft of torque fed to the front wheels only. Hyundai estimates that only about 20% of buyers will opt for that option; the rest, they say, will be going for the 235 hp, 260 lb-ft turbo four-cylinder and AWD. The turbo is a $2,000 option on the second-tier Preferred package, and standard on the other two trims. It’s a peppy little plant, especially at speed as it works well with the new 8-speed automatic transmission (no dual-clutch set-up or paddle shifters, though) to provide good in-gear acceleration for highway passing manoeuvres and so forth. It takes a little while to get going from stop – though it’s lither than previous, the Santa Fe Ultimate AWD still remains a 1,853 kg vehicle – but it’s not pretending to be a sports car, so if it allows you to pass with confidence, then it’s achieved its goal of being a safe, insulating family crossover. “Safe” and “insulating”; that’s about right. The one detail I kept coming back to throughout my drive was just how quiet, smooth and solid the Santa Fe felt. Measures have been taken to reduce drag for ’19, and with drag reduction comes less wind noise, too. Of course, wind and road noise is one thing when it comes to ride comfort, but you want to make sure you don’t forget about the necessary chassis tweaks. Obviously, Hyundai hasn’t as the Santa Fe rides as its luxuriously-appointed interior suggests it should. Big road divots and concrete sags were swallowed up with confidence-inspiring gumption, and while you will encounter body roll as the turns get more severe, I have feeling that even the more queasy amongst us will be just fine. I guess I could say that I wish there was a little less bounce from the rear end; I tried adjusting the drive modes (there are three: comfort, smart and sport) but alas, they are on-hand to modify the powertrain and AWD system only. A more heavily-laden Santa Fe may be better equipped to keep things in check but overall, it’s excellent when it comes to comfortable motoring. As far as what the drive modes do change: yes, throttle and transmission response are shortened or lengthened depending, but the real change comes to the AWD system; in “Sport” mode, for example, up to 50% of power can be sent to the rear – this is the only mode of the three that allows this. In normal driving, meanwhile, activate “Smart” mode to get 100% of the power sent to the front wheels, for better fuel economy. It all works a treat; On paved bends, you can feel the car rotate through while on the gravel roads we sampled, the ride was controlled and predictable. That’s all well and good, but I come back once again to just how well the Santa Fe rides. Having sampled the previous-gen vehicle (and the one before it), I wasn’t expecting that kind of isolation, luxury, and tranquility from the Santa Fe. From the styling, to the ride, to the powertrain, this is a well-rounded, road-trip-worthy crossover that ticks a ton of boxes. Well-executed, Hyundai. Well-executed, indeed.